It’s that time of year again when we’re looking to serve up some cool summer treats as we enjoy warm temperatures and backyard barbeques with friends and family. This no-fuss dessert is a cool summer treat. 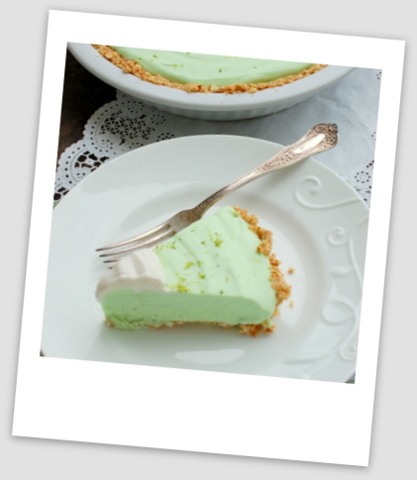 It’s creamy sweetness is balanced by a zesty lime flavour and perfectly complimented with a salty pretzel crust. And the best part is … it’s no-bake. As our house heats up without anything to cool it except ceiling fans, oven-free meals and desserts are at the top of my list for all of June, July and August. With a prep time of just 15 minutes, this is something I like to make in the morning while it’s still cool. I pop it in the freezer and then it’s there when my guys finally come home from a long day outside. It can be made days ahead of any entertaining you might be doing so it’s also a great desert idea for a backyard summer celebration. The ingredients are somewhat unusual, but not so unusual that you may not already have them on hand. I hope you give it a try this summer, the tart, sweet and salty flavours are sure to be a hit with kids and adults alike. 1. Mix pretzel crumbs, sugar and butter together and press into a 9-inch pie plate. Refrigerate until ready to use. 2. Mix sweetened condensed milk, lime juice, zest and kool-aid together in a large bowl. 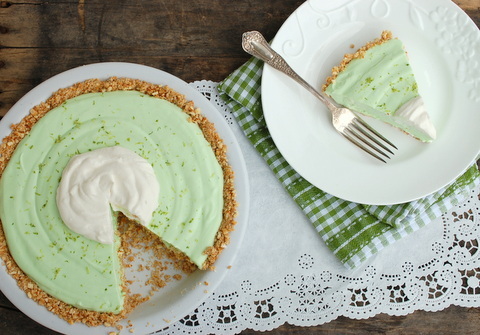 Whisk in whipped cream and pour into crust. 3. Place in freezer for 6 hours before serving. You can jazz this up with a dollop of whipped cream and some grated lime zest before serving. Love the colour… it looks delicious! The gorgeous colour comes from the secret ingredient … lemon lime kool-aid … a totally crazy thing … but it worked! It’s the first pretzel crust I’ve made but wow … I highly recommend it. And the Kool-Aid … I initially thought, “how weird is that”, but curiosity got the better of me and I just had to try it.